Custom post types are everywhere in WordPress. From selling products with WooCommerce to managing team members, you’re no longer limited to just Posts and Pages. That’s been great for WordPress, but it doesn’t take long for all of your custom post types to pile up and clutter the navigation menu in your admin area. In this post, I’ll show you how to use a brilliant little plugin, Hierarchy, to de-clutter your navigation menu and keep your content management in one place. I bet this looks familiar to a bunch of you. This is what a basic WordPress admin menu looks like after installing my restaurant menu, reviews and reservations plugins, as well as an event management plugin. 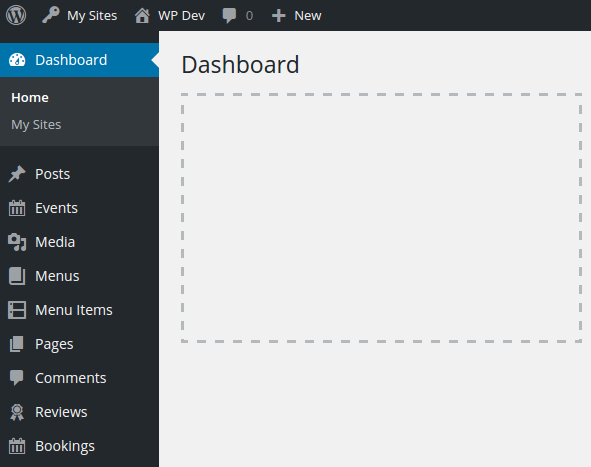 The WordPress admin navigation menu has really grown. For those of us who are old hands at WordPress, this is something we’ve grown accustomed to. But if you’ve ever had to train a client or an employee, you’ll know that the bigger it gets, the more daunting it is for new users. This little plugin lets you collect and organize all of your custom post types under a single menu item, cleaning up your navigation menu and giving your clients one place to manage all of their content. It treats a custom post type like a page, and slots it in alongside other pages, providing a handy top-down view of the content on your site. Once you’ve activated it, go to the Settings > Hierarchy page in your WordPress admin area. 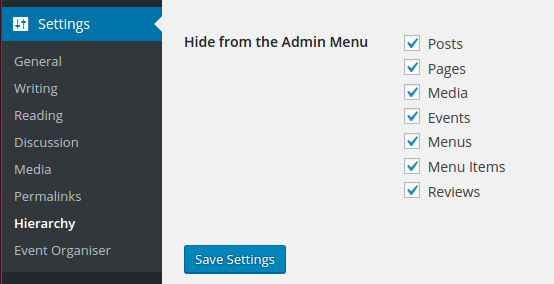 There’s an easy toggle to hide each of the default post entries from the admin area. On the settings page, you’ll also see an option to configure how each custom post type is displayed on the Content page. If you turn Show Entries on, it will list out the posts under a custom post type, just like nested pages. See how the events are shown below? This is great for custom post types where you’re likely to to only have a few entries, like your menus or reviews. But beware of using it for recurring things like Posts. The number of entries could accumulate and then you’d just have a cluttered Content page. You can read more about this great plugin in the Hierarchy 1.0 announcement post. Although it’s been around for a while, it hasn’t gotten nearly the love it deserves. Give your thanks to @jchristopher.